First, make sure that Indigo has enabled communication with the interface. If Indigo is not online with the interface, then choose the Interfaces→INSTEON/X10 Power Line→Enable menu item. See connecting the Interface in the Getting Started guide for more details. TIP: You may also need to bridge the two phases of your power line to get reliable communication. Search for “X10 signal bridge” in your favorite search engine for details. Every X10 device in Indigo is defined by a collection of settings that detail the characteristics of that device. 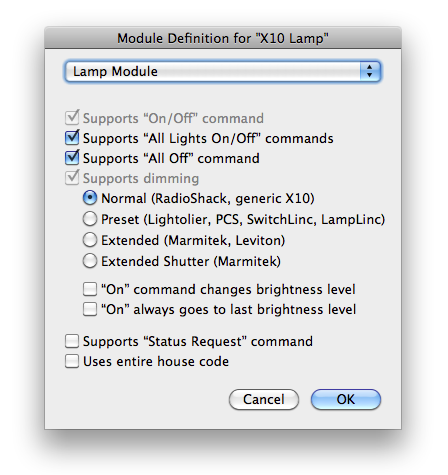 For example, there are several different X10 codes used to dim and brighten light switch devices. Depending on the type of device module used, it will respond to some X10 codes for dimming but not others. And some devices have additional features, like the ability to transmit back to Indigo when the device is turned on and off locally at the device itself. Normally, you will not need to worry about these device settings. By choosing the correct device type in the device dialog, Indigo automatically chooses the correct settings for that particular device module. If you know the specific features of your X10 device you can manually set them here. If you have difficulties finding the settings for a device you have, then visit our online support forum. It is possible that one of our users has already discovered the correct settings to use.